Hundreds of Nigerians in British jails could be sent home to finish their sentences under a multimillion pound deal now being negotiated by the government. Talks are starting on a British investment to improve prison conditions in the west African country so as to allow the transfer of as many as possible of the 400 Nigerian prisoners here. The UK Border Agency\’s chief executive, Lin Homer, outlined the deal to MPs as she presented a six-monthly update on the progress made in deporting foreign national prisoners and in dealing with an asylum backlog of up to 450,000 outstanding case files. In the past the Home Office has contributed towards the cost of building a prison in Jamaica to assist speeding up foreign prisoner transfers. But with Nigeria a change in the country\’s constitution will be needed first to allow prisoner transfers without individuals\’ consent. She said that the Nigerian prison authorities would need to expand their jail capacity to cope with the extra inmates. And conditions in Nigerian prisons would have to pass a minimum human rights standard for the scheme to work. 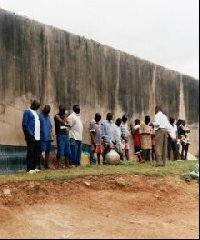 Human rights groups have called conditions in Nigerian prisons \”appalling\”. Amnesty International described \”severe overcrowding\”, with more than half of inmates awaiting trial, some for up to 10 years. The prisoner transfer agreement being discussed would also allow Britons held in Nigerian jails to return to the UK, the Ministry of Justice said. The Home Office said the two governments were looking at equipping and upgrading existing jails, as well as training prison staff. A spokesman said: \”We believe prisoners should normally serve their sentences in their own country – freeing up prison spaces and saving the taxpayer money on enforced removals. Homer told the Commons home affairs select committee that the UK Border Agency was on track this year to deport 5,800 foreign criminals. She said 20% of the 984 former prisoners, identified this week as missing after breaching their licence terms, were foreign nationals. With regard to the asylum cases, Homer said that more than 197,500 of the 450,000 cases had been resolved by the end of May. Of those resolved, a third (62,000 people) had gained permission to stay in the UK. For 27,500, removal directions were issued.